No one likes to eat alone; to approach a table filled with people, only to be told that despite the open chairs there isn't room for you. The rejection stings. It leaves a mark. Yet this is exactly what the church has been saying to far too many people for far too long: "You're not welcome here. Find someplace else to sit." This is antithetical to what we see in the life and ministry of Jesus, where diversity is a given and where the inherent value of all people is placed front and center. How can we who claim faith in Christ expand the table and embody the community Jesus envisioned? How can we extend unconditional welcome and acceptance in a world increasingly marked by bigotry, fear, and exclusion? Pastor John Pavlovitz invites readers to join him on the journey to find—or build—a church that is big enough for everyone. He holds a mirror up to the modern church and speaks clearly into the heart of the issues the Christian community has been earnestly wrestling with: LGBT inclusion, gender equality, racial tensions, global concerns, and theological shifts. 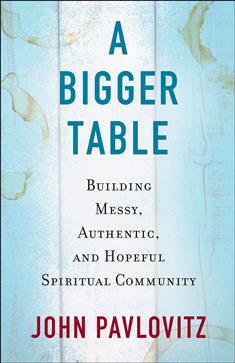 A Bigger Table: Building God's Messy, Authentic, Hopeful Community asks if organized Christianity, which has become ever more politicized in focus and narrow in scope, can find a new way of faithfully continuing the work Jesus began two thousand years ago, where everyone gets a seat. Pavlovitz shares moving personal stories, his careful observations as a pastor, and his understanding of the ancient stories of Jesus to set the table for a new, positive, more loving conversation on these and other important matters of faith. He invites us to build the bigger table Jesus imagined, practicing radical hospitality, total authenticity, messy diversity, and agenda-free community.